Mobile card payment service SumUp has launched its free mobile point-of-sale technology in the UK, Ireland, Germany, and Austria and opens with a standard 2.75% per transaction fee. The new service will compete with UK service mPowa for the estimated 1.5 million small businesses looking for an alternative to the standard point of sale terminals, which are often rented on expensive fixed-term contracts from the payment service providers. With SumUp, merchants use a free app and a free card reader to turn their mobile devices into tills capable of processing payments from debit or credit cards. The merchants are then charged a standard 2.75% of every transaction made using its app and card reader. Daniel Klein, CEO of SumUp, commented: "A lot of small businesses are operating on very tight margins, and can't afford to lose out on making a sale because they can't process a card payment. However, they are all too often discouraged from partnering up with banks and renting conventional payment terminals because of the expense and difficulty inherent in doing so. Our mission is to reduce the expense, remove the difficulty, and make it possible for every merchant—no matter how small, unique, or mobile their business—to accept card payments. We're taking the pain out of taking payments, and we're helping small merchants to build stronger relationships with their customers." 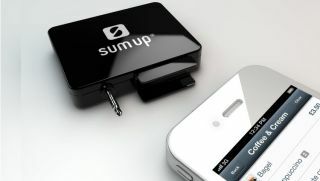 The SumUp payment systems are available for Android and iOS devices and fit any smartphone with a standard headphone jack. Merchants simply open the free SumUp app, and enter the amount to be transferred. The customer is then prompted to insert their card and authorise the transfer by signing with their finger on the touchscreen of the device. The app confirms the transaction on screen immediately and offers to send a receipt to the customer via email or SMS. The SumUp app has been launched after the successful completion of a thorough four-month test period, where it has been tested with the Europay, Mastercard, and Visa (EMV) specifications and has full PCI-DSS certification – the highest security standard for card payments. The launch also follows an eight-digit Euro Series A funding round, with investors including b-to-v Partners, Shortcut Ventures, Tengelmann Ventures and renowned technology investor Klaus Hommels. It can only be a matter of time before Twitter founder Jack Dorsey's mobile payment service Square which recently received a £125 million injection of cash follows with a UK launch.